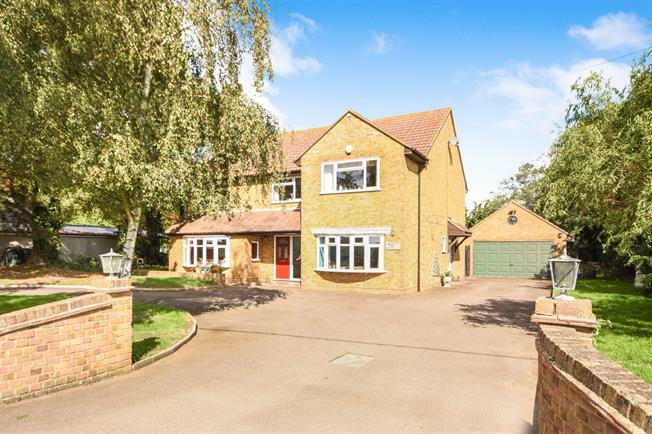 5 Bedroom Detached House For Sale in Burnham-on-Crouch for Offers in excess of £800,000. Situated on a plot of approaching 0.75 acres, is this imposing, five bedroom detached family home on the outskirts of Burnham on Crouch in a quiet location offering field views to the front. The ground floor is home to three generous reception rooms, a further sun room and a kitchen breakfast room in excess of 19 ft. The first floor is home to five double bedrooms with the 21 ft master benefitting from an en suite shower room, and an extensive array of fitted furniture. The rear garden commences with a patio surrounding the 40' Roman ended tiled swimming pool, which is well screened with a raised grass planted area. A door from the patio adjacent to the sun room leads into the pool room which then leads into the changing room with toilet and shower facilities. The remainder of the rear garden is mainly laid to lawn, and both sides of the garden are well screened by a range of mature hedging and trees. The front of the property features a in and out carriage driveway and ample parking for multiple vehicles and access to the detached double garage. We highly recommend a viewing of this property to appreciate the size of the accommodation on offer. .
Contiunation of oak flooring, uPVC bay window to front, mahogany fireplace with a carved wood mantle with a marble fire surround, and inset coal effect gas fire. Tiled flooring, uPVC door to garden, and double glazed uPVC windows overlooking the garden, a range of base and wall mounted oak units, with laminated roll edge work surfaces, inset stainless steel sink and drainer, space for a double range oven, space and plumbing for dishwasher and washing machines. Laminate flooring, uPVC bay window to the front, storage to the side, door to the cloakroom.